The desert area surrounding Phoenix and Scottsdale are ripe with hiking opportunities, from half day hikes just minutes from the City of Scottsdale to full day hikes in the Superstition Wilderness just east of Phoenix. The Sonoran Desert is home to unique vegetation, canyons, creeks and mountains – flora, fauna, ancient Native American ruins and scenery like none other in the US. Our knowledgeable and professional guides will lead you on your way through the desert and show you why, aside from the fantastic weather Fall through Spring, Phoenix weather forecasts are called “hiking forecasts.” All the locals know where to hike, and we are ready to take you on a Phoenix day hike only the in-crowd knows! A Scottsdale half or full day hike is only a 20 minute drive from the JRI Gear Store in North Scottsdale. Choose from easy trails such as the Gateway trail head to Tom’s Thumb and Sunrise Peak for some of the best views of the Valley of the Sun! Here are some of the popular hikes Just Roughin’ It offers in the preserve but these are not the only possibilities. For a full day hike that really gets you out to the vast and more secluded Sonoran Desert regions in the Phoenix area, take a hike in the Superstition Wilderness. 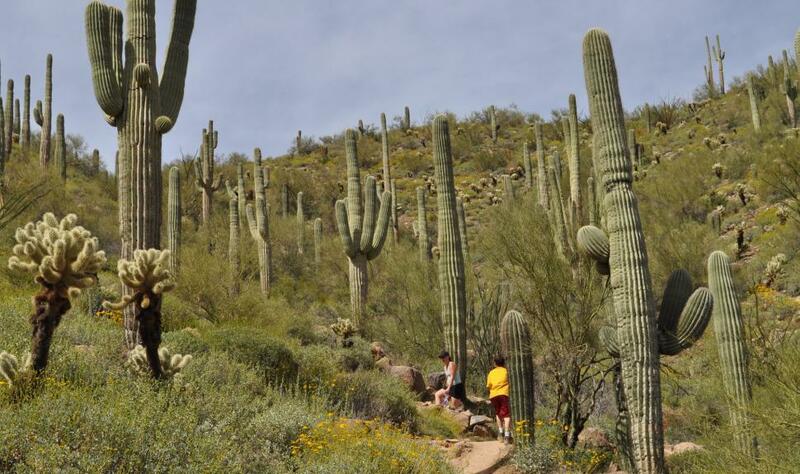 Many of these trails are at least an hour drive from Scottsdale, but well worth the ride – desert flora and fauna, views for miles and evidence of the civilizations that inhabited the area several hundreds of years back. All of the options listed below are full day hikes. Scenic Canyon Lake is the starting point for the Boulder Canyon trail. This hike gains 600 feet in elevation as the trail reaches two viewpoints where there are beautiful vistas of Canyon Lake as well as the imposing Battleship Mountain with Weaver’s Needle in the distance. There are several options for this hike that vary in difficulty. Distance: 6 to 10 miles. Elevation Gain: 600 to 1,200 feet.